This novel was completed during the Ming Dynasty (16th Century). Showing the ancient theme of punishing evil and promoting goodness. Along the way he crossed many mountains, and rivers, and was invaded by demons and ghosts. During this journey, the demons were eager to eat the meat of Tang San Zang. Because they believe that after eating the meat they will live forever, and not get old. The buddha believed that Tang San Zang needed four apprentices to accompany him. The first apprentice is Sun Wukong. He is very smart and magical, but has a bad temper. 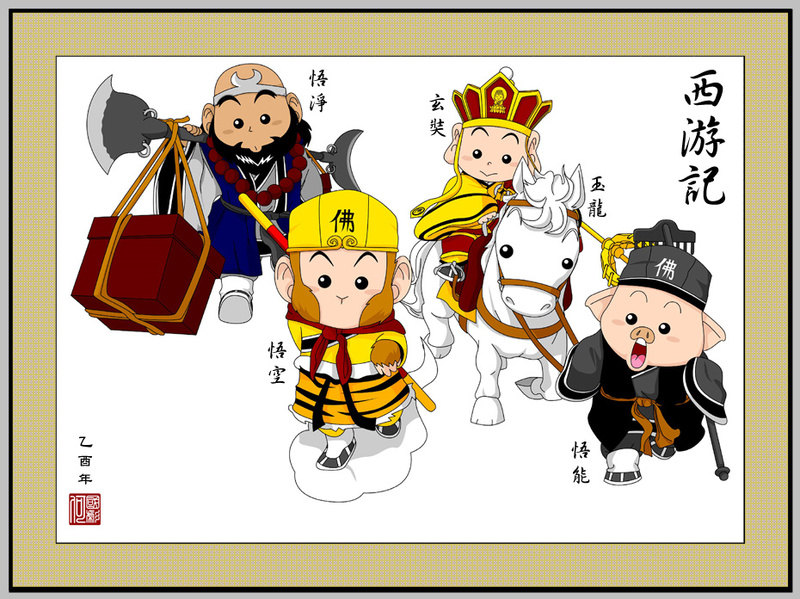 The second apprentice is the pig, who is greedy, cowardly, and often quarrels with Sun Wukong. 十分忠誠.The third apprentice is Shaw Wujing, who is quiet, diligent, and loyal. In addition, White Dragon horse called Tang Sen his master, and called Sun Wukong his brother. Tang San Zang received the golden hoop system from Buddha. The gold hoops are placed on the apprentice’s heads. When Tang San Zang reads a curse, the hoop will tighten around the apprentice’s head, making them roll around in pain. After 16 years, Master Tang San Zang and his apprentices finally received the supreme scripture. 惩恶扬善/懲惡揚善 punishing evil and promoting goodness. 西天取经/西天取經 the far west searching for the supreme scripture. 长生不老/長生不老 live forever, and not get old. 满地打滚/滿地打滾 roll around in pain.